Starting a family is a big decision. For most new or expectant parents, the biggest change is making sure your new addition is well taken care of. Aside from the baby classes, nursery decorating, and making your home baby-proof, having a reliable family car is just as important. If you are due soon, finding an affordable and family-friendly car can be a difficult task. 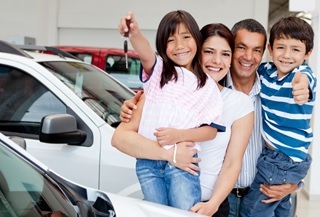 Make it a little easier by taking a look at the best cars on the market for new families. At just under $20,000, this family car is the perfect addition. When you’re searching for an affordable new family car, the Honda Civic LX 4-Door is just right for those who are looking for something reliable, fuel efficient, and easy on the monthly budget. The roomy interior and smooth ride is perfect for newborns and all the things that go along with a new family addition. The 4-door body style is less expensive and allows for more ease for car seats and safety for precious cargo. Although the Buick Enclave is a little more expensive than other similar cars on the market, around $35,000, it is a great option for new families. As an SUV, it allows for more room for larger families, more space for new baby supplies, and an easier and more comfortable ride. Plus, with all the luxury features such as blind-spot monitor, rear cross traffic alert, and backup camera, you’ll feel more at ease with your new baby in the car. Make sure to ask about warranties before purchasing. Chryslers are known for their affordable luxury, but they make great family cars as well. The Chrysler 200 is one of the best sedans for new families. With a smooth ride, all-wheel drive, and fuel efficiency that can reach up to 36 miles per gallon, it makes the perfect addition to any family. Aside from the roomy interior and smooth highway ride, you’ll get the latest technology in an affordable sedan. Collision warning, parking assistance, and blind-spot cameras are just some of what makes this a perfect new family car. Prices typically start at a budget-friendly $22,000. This affordable family car option is perfect for those on a budget or with bills to pay. Starting at just over $19,000, the Subaru Impreza is just right for new families. With 37 highway miles per gallon, you’ll fill up less often. What makes this the right family car is the hands-free technology. Make calls, answer texts, or get directions through voice command on your phone. The Bluetooth technology is the safest way to drive with your little ones in the car. The Mazda 3 is one of the most affordable family cars on the market coming in right under $18,000. With 41 highway miles per gallon, you won’t have to worry about increasing gas prices. The stylish and sporty look is perfect for younger families, but the five passenger seats allow for a roomier ride. For families with multiple children, the wide backseat allows for multiple car seats. 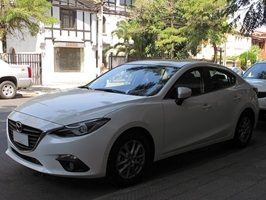 The Mazda 3 is one of the only new family cars on the market with luxury technology in a compact car price range. As one of the most classic SUV models, the Jeep Cherokee has been around for decades as an adventurer’s perfect ride. However, the Jeep has transformed in the last few years as a reliable family car. With 31 highway miles per gallon and an affordable $24,000 price tag, the Jeep Cherokee is just right for families on the go. The all-wheel drive and terrain wheels make this model perfect for snow, sand, and rain. The SUV style is perfect for making room for strollers, car seats, and diaper bags. Vans are commonly known as the perfect family car, but the Honda Odyssey is more than just a family car. With some of the most impressive features on the market, it has a built-in vacuum, in-seat entertainment, and an entire row that can accommodate up to three booster or car seats. With a little bit of a heftier price, starting at $33,000, this would be just right for those with multiple children or the need for more room. Next page Next post: A Car Buyer’s Conundrum: Compact or Subcompact?